Learn how to make a Hermes Dreaming Poppet! and a wonderful trigger for future magickal applications that involve meditation, spirituality, artistry, and creativity. Even if you don’t make a poppet — you can certainly catch this wave of opportunity! About my learning modules –– For several years I have been considering how to share individual topics I’ve been working on in an artful, dedicated manner. Too short for a book — too long for an article, I spent a great deal of time contemplating how to present the information. Many times the work would be excellent for a two hour seminar; but, my travel was (for family reasons) limited. Last year I began crafting Learning Modules dedicated to Braucherei and Granny Magick. As I finished each module I gained more confidence. The students, many I have never met in person, urged me forward with their comments, support, and dedication. In December of 2013 I ran my yearly Release Program. In an effort to turn my daily work into an overall theme for myself, I decided to focus on angels as the magickal aspect of the Release Program. As I wrote for the program, I expanded some of the information into the learning module I was creating at the time. I also designed angelic artwork coupled with astrological symbolism for my Etsy store. Working in the same theme — designing, art, writing — was a great relief. I was no longer scattered or frustrated. Words sparked on my keyboard and artful visions filled my mind. When January rounded the corner, and the Release Program had ended for another year, I sat back and thought — you tell people to do their passion, and yet, here you sit — passionless. What is your passion? My answer: Writing AND art. Not one. Not the other. Then I said to myself, what have you been working on these past two years? The answer was easy. I’ve been drawing my own patterns to sew, posting many of my projects on my blog, and selling finished pieces on Etsy. From designing, to photographing, to illustrating to writing — I have enjoyed the total experience of putting all the pieces together. I have also been studiously working with astrological magick, trying to better myself and help my friends and family. Have you enjoyed that? I asked. Okay, I said to myself. Why not write a short how-to on poppets? Make a few patterns, talk about how you’ve been working with them — maybe ten pages or so. Twenty tops. Make a downloadable lesson on the subject which will allow you to focus on one topic and add clear, color illustrations to the work. And so I began. Designing, crafting, illustrating, snapping pics as I moved along. Several times in the past two months I’ve been snowed in out here in the woods. I didn’t really notice. I was creating! Ten pages quickly blew into twenty. Twenty soared to fifty. Fifty jumped to seventy. And all the while my poppet collection grew. Each with a task. Each with something special to do! Another idea. More pages. Until, finally, I realized I was sitting on the completed module — 93 pages. May your poppets work for you as well as they’ve worked for me! 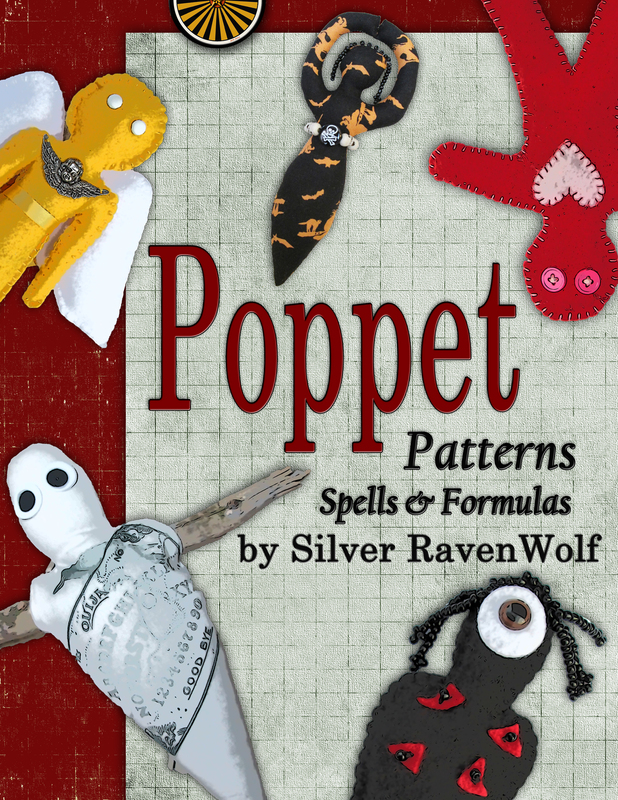 An amazing offering from celebrated author, Silver RavenWolf filled with a glittering treasury of information that includes step-by-step information for ritually constructing and empowering fabric, paper, clay and stone poppets. Never before published – unique and original! All photos, drawings, and illustrations designed by the author. A SacredMother Wishing stone – a wonderful magickal vehicle to carry with you. The Hermes Dreaming Poppet – to capture solutions to your problems in dreamtime. 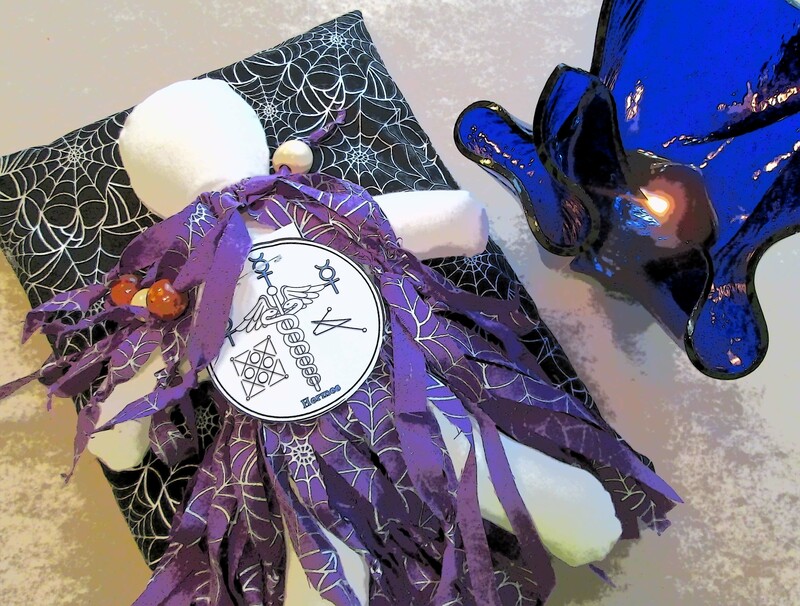 Healing Rag Poppet – to give to friends in family when they need healing energy the most! The Goddess Poppet – to bring the power of your favorite Goddess into your magickal life. The Reversal/Protection Mirror Box – to house or work with your clay, paper, or cloth poppets to send back negative energy, capture a liar or thief, or provide protection for someone you love. 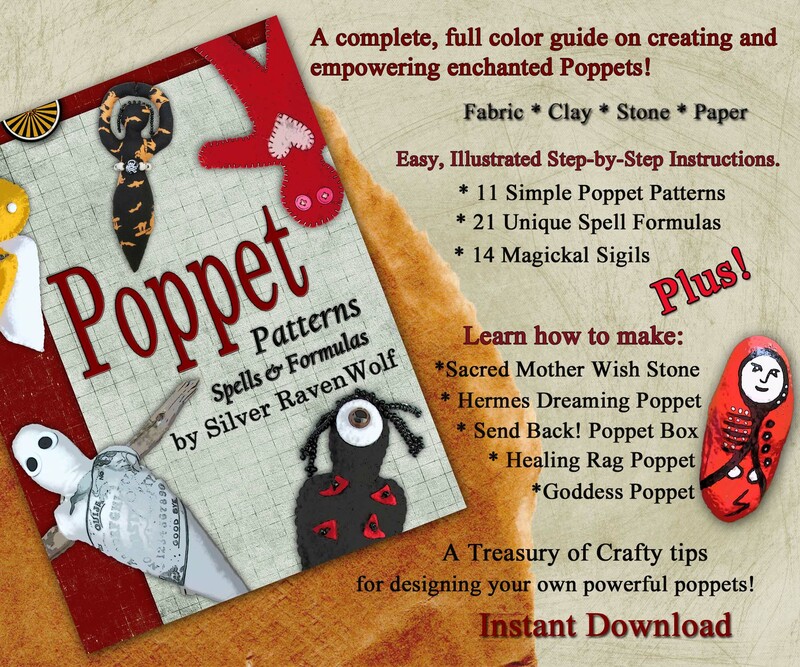 Discover the amazing power of poppet construction with this informative learning module that contains practical wisdom, magickal techniques, and crafting expertise. May de power of de dolls be with you!